Maybe closer to 2.5 stars. I really wish I could've enjoyed this more, as I absolutely love this series, but I had two big problems with Secret. First, the lack of plot. Second, the romance. Now, I hadn't read the novella Breathless before reading Secret, so I didn't know about Nick's big secret. And to be honest, that's part of the reason why I didn't love this book. I do not support gay rights at all, so I was disappointed in the romance and I did skip over many of the scenes with Nick and Adam. But on to the plot. What happened? There was hardly any action happening at all; instead it was replaced by tons of melodrama. What happened to the edge-of-your-seat, action-packed plots in the first three books? All three of the first books had some romance, but the romance never overtook the main storyline and there was always so much mystery and intrigue. I didn't find any of that in Secret; as there wasn't much of a focus on the plot. I wish there had been less drama and more action. There's also the fact that there are two romantic storylines going on in Secret, as opposed to one in the previous books. In Secret we have two dual points of view: Nick's and Quinn's. I already mentioned how I wasn't a fan of Nick's storyline, but I did like reading from Quinn's point-of-view a lot. I like the way her past was uncovered and how she found someone who understood and accepted her. I'll admit I was surprised by who her love interest was - I totally didn't see that coming! I won't say his name to avoid spoilers, but it was a pleasant surprise, and even though I wouldn't have thought I'd like Quinn's love interest, Kemmerer made their relationship work and I ended up really liking their romance. Yes, it might have a couple clichés, but I still loved it. Quinn's story was the one thing I truly liked about this book. 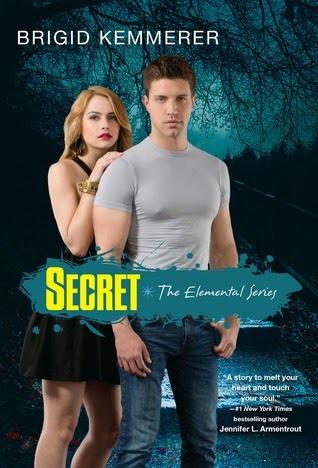 I'm sad that I didn't end up loving Secret as much as I'd hoped I would, but I still have high hopes for the final book in this series, Sacrifice (that title has me SO worried about what's going to happen!). Aside from Gabriel, Michael has always been my favorite Merrick brother and I'm looking forward to reading his story. So, would I recommend Secret? I disliked that the plot wasn't as action-oriented, but most other fans of this series seem to love it. Personally, it just wasn't for me.